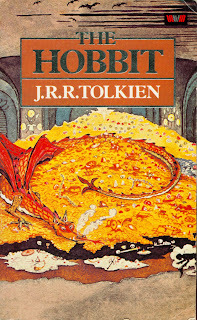 Despite reading this series in the wrong order, I finally finished The Hobbit, and I actually enjoyed it much more than the Lord of the Rings trilogy (which can be found on my blog here). This book follows the story of Bilbo Baggins as he travels to defeat and retrieve treasure from the dragon, Smaug. The most obvious reason why I found this more pleasurable to read was because it's significantly shorter than the following books. This meant that there wasn't as much unnecessary descriptions that I found slightly boring and caused the novels to drag in my opinion. The Hobbit was much more fast paced which kept me wanting to read more. I also found the story line to be much more exciting than the trilogy. I loved starting from the beginning and seeing where the LOTRs emerged from. I really enjoyed finding the links between the Frodo's adventure and Bilbo's and how these related to each other, flashing forward to Gollum's experience with Frodo in the upcoming series! Because I actually read this book after the main trilogy, I knew what was going to happen after so that allowed me to make these links but if I had read them in their intended order, I reckon I'd have enjoyed it just as much! The film adaptation of this novel was released a few years ago now but I've never seen it although I've been desperate to! I ALWAYS prefer to read the books first so that's what I've done, and now that I've completed it, I can finally check out the film and see whether it stayed true to the book or took its own direction!